While many agencies talk about integrated media planning and buying, Ionic Media delivers on the promise. At Ionic we understand digital and engagement marketing go hand-in-hand, each one complimenting the other and enhancing campaign results. With digital marketing added to the marketing mix, engagement with consumers becomes more consistent and continuous throughout the customer lifecycle because campaigns are optimized to be omni-channel. This means they exist in more than one format for customers to easily view via mobile, desktop, or tablet throughout the day. An omni-channel approach increases the likelihood a customer will respond positively to a campaign’s call-to-action. We combine the power of building brand awareness with the call to action and ROI of direct response. Cross-channel media leverages real time connections between your brand and your always-on audience. We manage your consumers’ journey through the funnel—from prospect to sale – by aligning the media tactics with marketing objectives. has over 25 years’ experience as a marketing and media executive managing some of the world’s leading media and entertainment brands. Before launching Ionic, Jeff was a partner at The McKenna Group, running the media and entertainment practice. Previously, Jeff worked at The Walt Disney Company as the SVP/GM of Ecommerce for their Internet division. During his 6-year tenure with Disney, Jeff was responsible for pioneering their online marketing, media and ecommerce strategies. Prior to Disney, Jeff held positions as the brand manager at Time-Life in charge of their video and television division and as the Director of Marketing at TV Guide. Jeff started his career working for several direct marketing agencies including Corinthian Direct and Western Media Direct. is a 30-year veteran of the media industry, managing a significant string of successful entrepreneurial ventures. At his first media buying company, Corinthian Media Buying, founding its DR subsidiary, Corinthian Direct, which increased signficantly to over $100-million in billings after just three years. After Corinthian, Michael became president of Club Med Inc. Michael then co-founded Media Incorporated, which was sold to IPG in 1996. Michael then went on to co-found, Evaliant Media Resources, a Web-based advertising tracking firm, which was sold to CMR in 2002.
has over twenty years of marketing experience in both traditional and all forms of digital media. Phil is an expert in planning, executing, testing and analyzing search performance and the attributional impact of other marketing channels on paid search. Phil takes a high-touch, hands-on approach to campaigns, optimizing toward marketing objectives (growth and efficiency) and hitting the target KPIs for branding and direct response in verticals ranging from healthcare, automobile, consumer product goods and more. Certified in Google AdWords (Fundamentals, Search Advertising, Display Advertising, Video Advertising, Shopping Advertising and Mobile Advertising), Google Analytics, Google Tag Manager and Bing Certification, his knowledge and passion will help your business succeed. 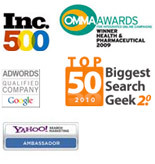 has directed digital media including paid search, social media, and display advertising at Ionic for 10 years. She has successfully implemented campaigns using traditional and emerging media forms including broadcast, print, out of home and various forms of digital and social media. Her knowledge of digital media is exceptional, and her skill set can quickly launch your business to new heights. Sharon thrives on partnering with clients to achieve their goals, and constantly works to stay ahead of the curve in regards to trends, strategy and technologies.